A U.S. Navy warship carried out a Freedom of Navigation (FON) operation in the South China Sea, reports said Wednesday. This was the first such operation in the disputed region under Donald Trump’s presidency, and the move was reportedly intended to show China U.S. wants to keep the South China Sea open. China claims the entire South China Sea. Brunei, Indonesia, Malaysia, the Philippines, Taiwan, and Vietnam have overlapping claims. 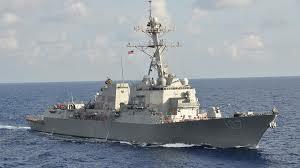 The guided-missile destroyer USS Dewey sailed within 12 nautical miles of artificial Mischief Reef in the South China Sea's Spratly Islands, Reuters reported, citing U.S. officials. China has built an artificial outpost, which has an airfield too. The Defense Department did not confirm the reports. “U.S. forces operate in the Asia-Pacific region on a daily basis, including the South China Sea,” Defense Department spokesman Jamie Davis said in a statement, according to Bloomberg. The U.S. has been conducting regular freedom of navigation operations in the South China Sea, angering Beijing. While the U.S. has continued to oppose China’s growing aggression in the disputed region, Beijing has held Washington responsible for creating tensions in the South China Sea region. Other claimants of the South China Sea have blamed China of militarizing the region. However, Beijing defended its actions saying its military equipment will help in the safety of the region, from where about $5 trillion worth of trade passes every year. In March, the Asia Maritime Transparency Initiative (AMTI), a branch of the Center for Strategic and International Studies (CSIS), released satellite images showing China finishing the construction of its military infrastructure on the South China Sea islands. According to AMTI, the images showed China’s naval, air, radar and defensive facilities were nearing completion. Following this, China’s military aircraft would be able to fly over almost all of the South China Sea with the help of three air bases in the Spratly Islands, and one on Woody Island, the largest of the Paracel Islands. “The same is true of China’s radar coverage, made possible by advanced surveillance/early warning radar facilities at Fiery Cross, Subi, and Cuarteron Reefs, as well as Woody Island, and smaller facilities elsewhere. China has maintained HQ-9 surface-to-air missile systems on the Woody Island for more than a year and has on at least one occasion deployed anti-ship cruise missiles to the island,” the Washington, D.C.-based think tank said in the report. In March, Chinese Premier Li Keqiang stressed the defense equipment on the artificial islands were to maintain freedom of navigation in the region. "Even if there is a certain amount of defense equipment or facilities, it is for maintaining the FON," Keqiang said. "Because without such freedom or without stability in the South China Sea, the Chinese side would be among the first to bear its brunt," he added. The premier also said his country is not militarizing the South China Sea. "With respect to the so-called militarization, China never has any intention to engage in militarization in the South China Sea," Keqiang said at the time.